In my spare time, I create content for a personal website that's dedicated to discussing things happening in the video game industry, and one thing I've never shied away from is my adoration of the Assassin's Creed franchise. I know it sounds silly to expect jeers whenever I admit I'm a fan of such a popular series, but a lot of people have grown tired of these games. With the exception of a couple of titles that were more like �live the life of a pirate' simulators, publisher Ubisoft has done very little to innovate the core formula: Sneak around, assassinate targets, climb towers to open up details on the in-game map, and leap off of high vantage points... because it looks cool, I guess. Not only that, but their greed caused them to release a poorly optimized game - Assassin's Creed: Unity - because they refused to deviate from their annual release plan. Two years later, and Ubisoft were basically forced to take a step back, understand that consumers won't put up with shoddy games anymore, and gave Assassin's Creed a much needed year off. What does this have to do with the movie? Well, when it comes to video game adaptations on the big screen, Hollywood needs to learn to strike while the iron is hot, and at the moment, it's about as cool as a cucumber. But, hey, a good film will find an audience as long as there's positive word of mouth� and unfortunately, if that conversation actually exists somewhere, I won't be able to contribute. This adaptation takes place in the same universe as the games, but opts to follow the trials of new character Callum Lynch (Michael Fassbender). As a child, he witnesses his mother's murder at the hands of an Assassin, and spends the rest of his life on the run until he's captured and given a death sentence. 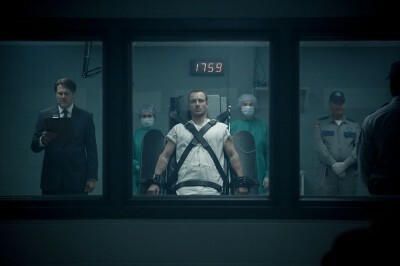 After receiving a lethal injection and slipping into what he believes to be eternal sleep, Cal awakens in Madrid, Spain, within Abstergo Foundation's walls. He's promised an opportunity at a better life, but only if he helps an order of Templars in finding the �Apple', a device which allegedly holds the genetic code for free will. Why go through the trouble of pulling a man off death row instead of finding some other chump? Because as a direct descendant of Aguilar de Nerha - a 15th century Assassin who knew where the Apple was hidden - Cal is the key. Abstergo has a machine, the Animus, which can tap into ancestral genetic memories, so all they have to do is hook him up to a large mechanical arm Matrix-style - which allows the user to move freely, more or less, and experience sensations while fighting, falling, etc. - and wait until the information they desire has been extracted. The first time Cal is plugged in, he's whisked back to Andalusia, Spain, where Aguilar and his partner, Maria, attempt to secure the Apple from the Templars. Unfortunately, since Cal is ironically doing Abstergo this �favor' against his own free will, he's unable to stay in sync with Aguilar's memories, and is therefore kept in captivity until the Foundation gets what it wants. As he awaits being force-fed to the Animus again, Cal befriends other Assassin descendants held in captivity, and begins to realize that everything he's ever known might be a lie. That's the gist of it, although there's heaps of additional layers added, as if to tell filmgoers, "Yes, this is the video game adaptation you can finally take seriously." I certainly appreciate the filmmakers good intentions, because this streak of lousy game-to-film adaptations should come to an end once and for all. I mean, all they make people do nowadays is grunt with disgust. Gamers have patiently waited nearly 25 years for that one, truly awesome movie to come and knock them off their feet, and what they got instead was Tomb Raider, Doom, Max Payne, Final Fantasy, Hitman, and the list goes on. 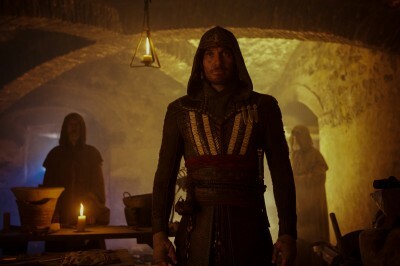 But unfortunately, good intentions don't always materialize into something positive, and as much as everyone involved wanted Assassin's Creed to be the new standard for video game inspired movies, it falls short, and by a wide margin at that. Honestly, the biggest problem I had with this film was that I just didn't care. About any of it. At all. The characters were dull, the plot needlessly busy, and the sequences set in 15th century Spain, while beautifully shot, didn't do much for me either. Take Callum, for example. He's unlikeable from the start and there isn't much the film does to change that perspective by the time the end credits roll. This guy is on death row, and when he's offered a chance at a new life - by helping an evil corporation at that - he decides to� well, do nothing. He's basically dragged in and out of the Animus until the process puts his life at risk. After that, he's told that if he doesn't decide to enter the machine willingly, it'll be extremely bad for his health. So when Callum decides to finally spring into action, it's not because he's �waking up' and trying to figure things out for himself. No, it's because the choice was made for him. And that's this character's problem in a nutshell: Everything he does isn't to fulfill some sort of appreciable redemption arc, but because he'll probably die if he doesn't toe the line. Templars are dictating terms on one side, and Assassins on the other. Fassbender does an amazing job with the material as written, but as far as Callum as a character is concerned, there's nothing to root for. Fassbender also plays Callum's ancestor, Aguilar. His part of the story is far more interesting than anything happening in the present, yet it's also the most minor part of the film. I made no judgement when it was announced the historical stuff would only amount to a third of the film's runtime, but that decision was definitely a detriment. I wanted to see what Aguilar was going through more than anything, but his side of the story was only told in brief flashes. How am I supposed to feel the emotional beats the film wants me to when I barely got to spend any time with the character, or his partner Maria? Jeremy Irons plays the role of antagonist Alan Rikkin, the CEO of Abstergo. His ultimate goal is to secure the Apple so the Templars can take control of the world, which should be plot enough. However, a fair amount of time is spent on a thread in which his daughter, played by Marion Cotillard, has daddy issues. They're both great performers, but again, like Fassbender, the material they're provided just doesn't seem to resonate in any meaningful way. The only thing Assassin's Creed has going for it are the stunts and action pieces that take place in the past� but even then, the imagery is constantly blanketed in shades of black and a putrid, dusty yellow/orange. Director Justin Kurzel - known for his work on 2015's Macbeth - clearly knows how to film and cut a movie together, but the visual flare employed to differentiate the two time periods weigh the film down when there should be excitement in the air. After all this, what's left? Just disappointment, I guess. Fan of the gaming franchise or not, I went into this film expecting something that was merely �ok', because I wasn't na�ve enough to expect a miracle. But even with tempered expectations, I couldn't find a single character or plot thread to become invested in. To be fair, this isn't the worst video game adaptation I've ever seen, but considering that low bar has been set by the likes of Super Mario Bros. and Mortal Kombat: Annihilation, that doesn't exactly say much. So, let me put it like this: 2016's Warcraft was panned by critics everywhere. I watched it out of curiosity, and while it was dumb, predictable and had some extremely cheap looking sets and costumes, it at least had spectacle. It was at least fun to watch. So, for my money, I'd take Warcraft over Assassin's Creed any day of the week. This movie - and I say this without any hyperbole whatsoever - was putting me to sleep. If that doesn't spin the quality of this film into perspective, then I don't know what will. Assassin's Creed comes to Blu-ray with an AVC encoded transfer in an aspect ratio of 2.39:1, and it looks as good as the source can allow it to. Not that there's anything wrong with the source from a technical perspective - this movie was shot digitally and finished with a 4K DI - but rather its artistic choice. The modern day sequences are blanketed in darkness and colored with shades of blue and gray, and when I say �blanketed', I mean to an almost oppressive degree, especially in the Animus chamber. Worse yet are the 15th century sequences, which are coated in so much yellow, you'd think someone saw the improperly color timed The Good, The Bad and The Ugly transfer and used it for inspiration. And not only is it yellow, but there's also a lot of dust and fog obscuring the picture, and black levels here are even more oppressive than the present day stuff. I know a lot of reviewers panned this movie for being �too serious', and while I think that actually could have been a good thing, the film's visual style didn't have to reflect it to this degree. The visual tone alone makes Assassin's Creed a depressing film to watch. How does the Blu-ray handle this, though? As well as could be expected. Close-ups and especially footage from the modern portions show plenty of fine detail. The dingier aspects of the film, however, aren't ideal for providing that same level of clarity, so when we go back in time, things look a little less refined. The studio could have opted to boost sharpness a tad in order to trick us into thinking those moments look more impressive than they actually do, but they've wisely chosen to leave the digital source as is. But these complaints are subjective. From a technical standpoint, this Blu-ray conveys the source incredibly well. The past's persistent haze is free of blocking, there's no ringing to speak of, and gradations in color are represented well enough within the confines of SDR. 4.5/5. But how does the 4K UHD fare? Is it a worthwhile upgrade over the Blu-ray? Absolutely. 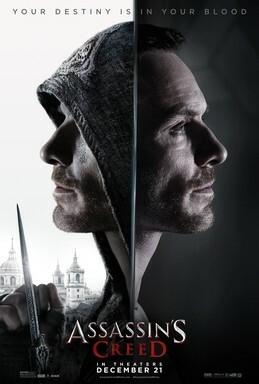 If you've read my review and still have a longing desire to see Assassin's Creed, the UHD is the way to go, because this film really benefits from the additional bitrate, and especially the inclusion of HDR. Encoded with HEVC at a resolution of 2160p in an aspect ratio of 2.39:1, that �depressing' feeling I had while screening the Blu-ray was somewhat alleviated (and I do mean only �somewhat'). It's still a depressingly dingy experience, but it is better on the UHD. That's because HDR allows more detail to appear within the shadows, and while the inkier blacks make the image appear darker overall, there's still an improvement in contrast between those shadows and everything else. Coupled with the increase in resolution, we're able to see a good uptick in detail. The modern day Abstergo stuff is the primary beneficiary, although 15th century Spain gets a little sharper and more detailed as well, even in wide angle shots. Don't expect miracles during Aguilar's bits in the film, as the urine-yellow color scheme (I'm not saying that to be mean, but that's what it reminds me of) mixed with generous helpings of fog and dust still tends to obscure, but there is an appreciable difference. Again though, like the Blu-ray, any shortcomings seen on the UHD are a direct result of the source, and not the sign of a lesser encode. 5/5. To be clear, I'm not saying the UHD is only .5 stars better than the Blu-ray. I'm rating each disc on their own merits, and that's how I will continue to review and contrast multiple formats in the future. The Blu-ray lost half a star because it's one of the few films I've seen where artistic intent doesn't allow for the 1080p encode to extract as much information as we're used to seeing on newer releases. The UHD received a perfect score because I believe it's the most accurate representation of what would have been seen in theaters, if not better. The actual score you see in �stars' at the top of this page will only reflect the UHD, since that's the primary product we were sent to review. To see which equipment I'm using at home to view 4K HDR content, please click my name at the top of this review. Fox's Blu-ray of Assassin's Creed seems to have some sort of copy protection which doesn't allow my usual method of screen captures to work. When viewing the film the way I need to in order to capture, Fox have made it so the video looks corrupted on every frame. I understand the need to protect their stuff, but it doesn't help with someone like me, a reviewer, can't show off what their product looks like to discerning consumers. Especially when it comes to a film this dark. If I can correct this in the future, I will, and provide screenshots at that time. This is my first review comparing and contrasting Blu-ray with UHD, and my experience listening to Assassin's Creed on Blu-ray and UHD was interesting. I'll state up front that I have a 7.1 setup, and it's not equipped with speakers in my ceiling or with something that fires upward for overhead sound. I figured the 7.1 DTS-HD Master Audio on the Blu-ray would be the same as the 7.1 Dolby TrueHD base from the UHD's Dolby Atmos track, but was surprised to find some differences. The Blu-ray audio is a solid 5/5. Dialogue is always clear and concise regardless of what's happening. Whenever the action picks up, sounds roar from every channel and the LFE isn't shy about joining the party. Every sound has been placed across all channels with precision. Even environmental sounds in quiet scenes are highly effective. I may have some qualms about the film's visual aesthetic, but the sound design is phenomenal. No matter what's happening, you'll have no problem feeling enveloped by this track. The score is played loud and proud, as well. Dynamic range is wide but not aggressive to the point where you would want to keep a remote handy (unless you're living in an extremely sensitive environment, in which case some headphones may still serve you well). The UHD, on the other hand, is even better, and also earns a flawless score of 5/5. Comparatively, while the Blu-ray had me wholly enveloped, the UHD's Dolby TrueHD track seems to open up a bit spatially, not only providing sounds with precise directionality, but with pinpoint depth. The score comes across a bit louder than before, and my favorite improvement overall is the increased bump in LFE. I wouldn't say the difference is night and day, but these subtle changes all culminate into a better overall experience. -Take the Pledge: Behind the Scenes of Assassin's Creed - This is a series of featurettes which covers the production of the film. This isn't the most comprehensive behind-the-scenes stuff I've ever seen, but these featurettes do clock in at just over 40 minutes in overall length, so there's a respectable amount of content to see. The only unfortunate thing about this supplement is that it partially has to make up for the lack of a director/cast/crew commentary. -Conversations with Justin Kurzel - At just over 20 minutes in overall length, we see conversations with the director in regards to: The Score, The Cut, The Effects, and The Story. 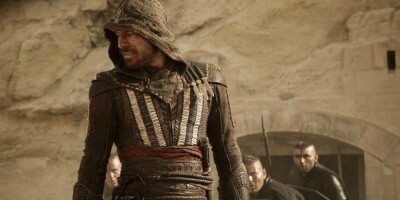 -Deleted Scenes Conversation with Justin Kurzel and Justin Tellefson - The film's director and editor revisit some of the cut Assassin's Creed content. -Deleted Scenes - A standard assortment of deleted scenes, which includes an alternate ending. -Galltery - This section of supplements includes Concept Art, Costumes and Weapons, and Unit Photography. Assassin's Creed is a frustrating, yet sobering look at how things tend to work in Hollywood. This film seemingly had it all: An award winning director, numerous Oscar winners and nominees, and a generous budget of $125 million. And yet, somehow, this ended up being one of the most uninspired movies I've seen in quite a while. Just goes to show that you can put together a dream team of cast and crew and toss as much money at a project as you want, but it won't guarantee a quality product. This isn't the worst video game to feature film adaptation I've ever seen, but as far as adaptations that actually had potential are concerned - because let's face it, nobody thought Double Dragon was going to rock - this is the film that's probably fallen the farthest. The stuff that takes place in 15th century Spain is interesting, but we don't get nearly enough of it. On the plus side, the 4K UHD disc is outstanding in regards to both video and audio. For supplements, you'll have to pop in the included Blu-ray disc, although I didn't find the provided content to be all that engaging. Skip It.